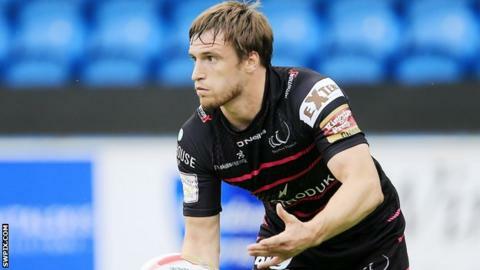 Joe Mellor and Patrick Ah Van scored hat-tricks as Widnes boosted their Super League hopes by beating Bradford. Adrian Purtell crossed for Bradford, before two Mellor tries and one from Ah Van put the visitors in command. The Bulls were back in contention when Omari Caro raced 80 metres to score, but Widnes dominated the second half. Mellor and Ah Van completed their hat-tricks, while Charly Runciman, Kevin Brown, Hep Cahill and Rhys Hanbury also got on the scoresheet after the break. The result lifts Widnes to second in the The Qualifiers and leaves them in good position to keep their place in the Super League next season. Bradford, aiming to return to the top-flight at the first time of asking, fall out of the top-four after suffering their second loss of the Super 8s. Bradford Bulls: O'Brien, Sidlow, Purtell, Ferguson, Nielsen, Addy, Williams, Mullaney, Clare, Pitts, Caro, Clough, Olbison. Replacements: Blythe, Mellor, Lauaki, Crossley. Widnes Vikings: Ah Van, Brown, Cahill, Dean, Dudson, Flynn, Galea, Gerrard, Hanbury, Mellor, Runciman, Tickle, White. Replacements: Clarkson, Heremaia, Manuokafoa, Whitley.